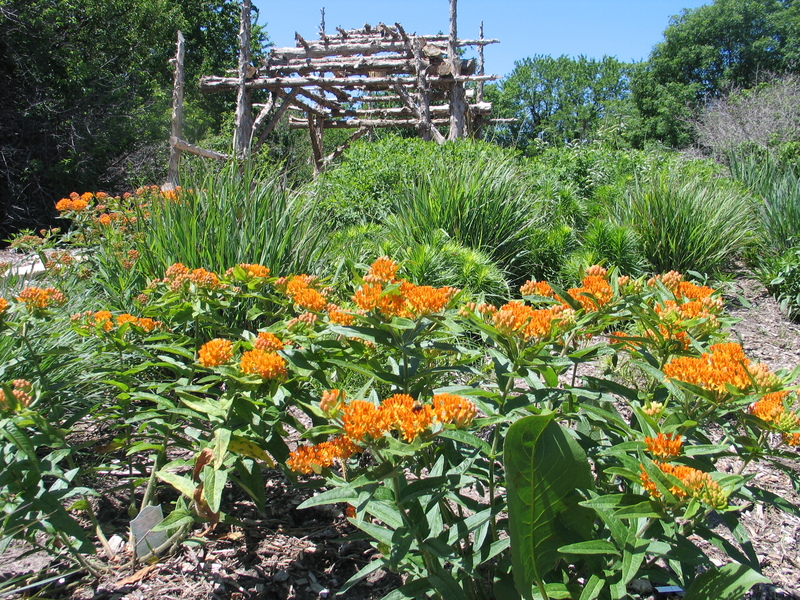 Many people who visit our FloraKansas Plant Sale are very interested in converting their gardens to using native plants, but they often are unsure of which plants to put together and in what configurations. 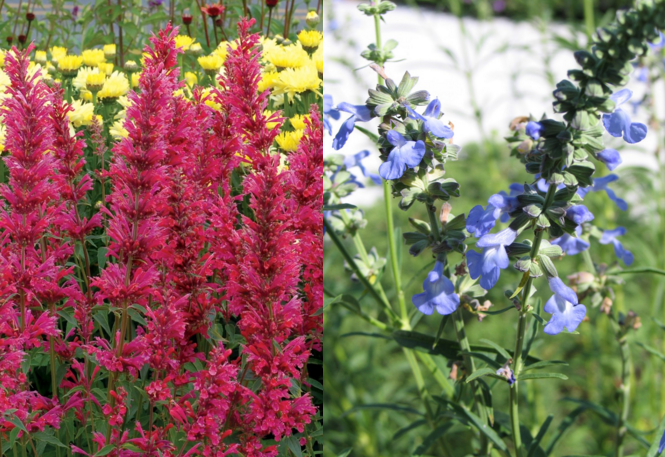 Here are a few tried and true combinations that I have enjoyed, both in our plantings at the Arboretum, and at my home. I hope these suggestions start to get your creativity flowing. 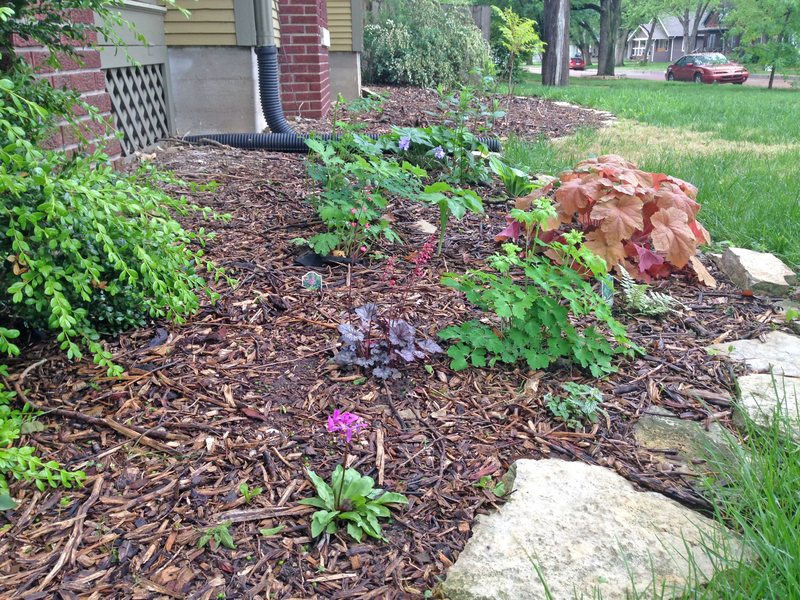 Use these native plant combinations in either a foundation or island planting. Each garden can be modified to fit your space. These plant combinations have been carefully selected to provide year around interest with minimal maintenance required, and will attract a diverse group of pollinators. 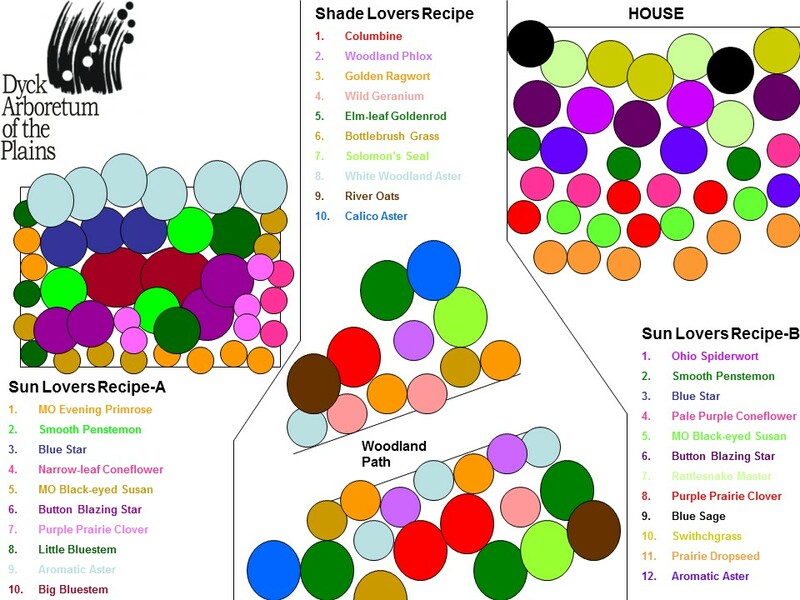 These combinations will provide interesting colors, textures and blooms throughout the growing season. 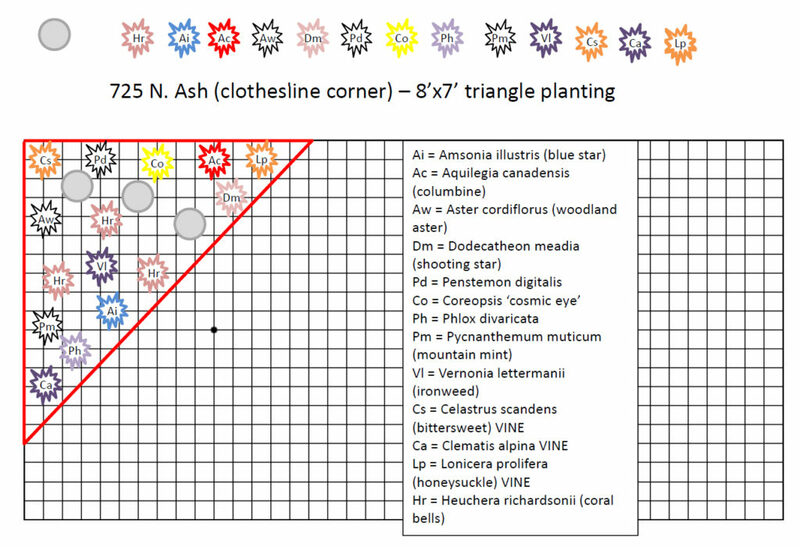 Each list of plants are for larger pots that are at least 12-18 inches in diameter. 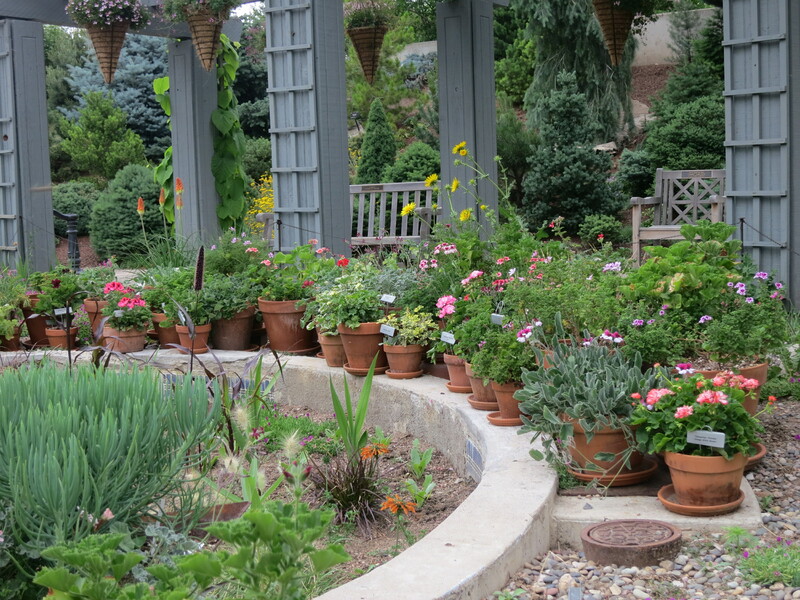 Place center plants in pot first, then arrange other perennials evenly around the rim of the container. I really enjoyed my potted native plants last year. It was amazing to watch the pollinators come up to my back deck. It was like having a front row seat. 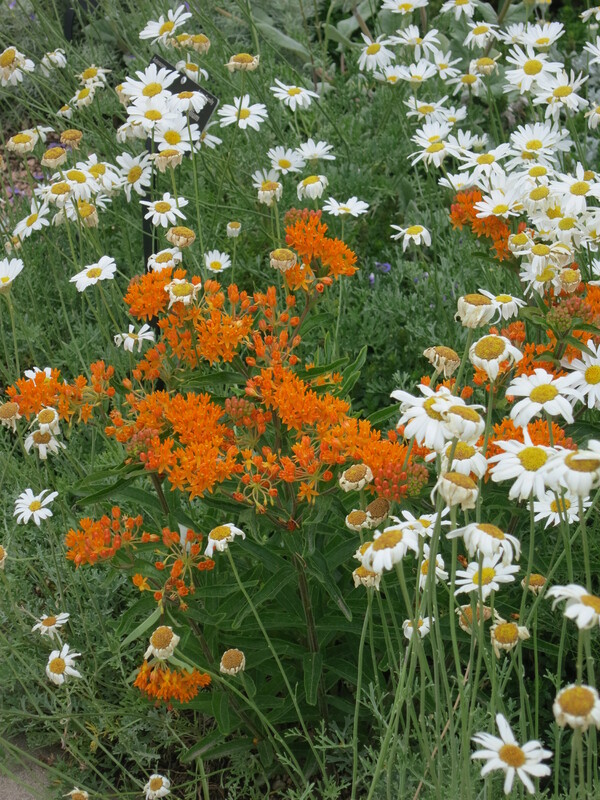 These are do it yourself native plant combinations that will work well, if matched to your landscape. They will provide easy care, attract a wide variety of wildlife, while providing beauty for your garden. Just choose a set of plants that fit your area or pot. As the saying goes, “…if you build it they will come” or in this case “…if you plant it they will come.” Have fun in your garden this year. Working in the Arboretum greenhouse is a terrible temptation. I love my perennial garden at home and I never stop adding new specimens, so our selection of natives and adaptables this year is a treasure trove for me. I must truly exercise some self control to prevent my entire paycheck from turning into wildflowers. Until I win the lottery or inherit a rich uncle’s fortune, I will have to just pick a few favorites! If you, like me, have a fond eye for every flower, then it may be helpful to guide your shopping this year by selecting a plant family to collect. Researching a scientific plant family and finding those species native to your area can help lend a theme to your garden, add cohesiveness, and curtail your wild garden spirit. This year I am going to plant from the mint family, Lamiaceae, or formerly, Labiatae. Lucky for me, our upcoming sale has lots of gorgeous options! 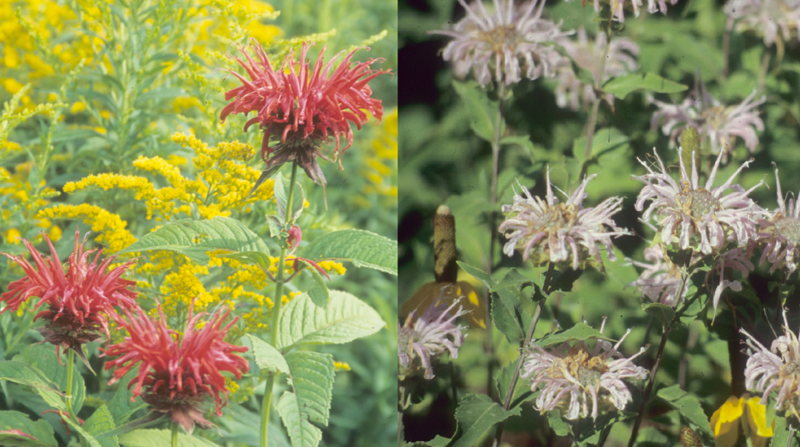 A red variety of bee balm shown with solidago (Left) and a light purple Monarda fistulosa (Right). Bee balm is part of the mint family. Lamiaceae (lame-ee-ay-see-ee or lame-ee-ay-see-ii) is a large plant family with of over 3500 species. In science lingo, families are groupings of plant genera – a fancy way to say that these plants share common traits. A tell-tale sign of a mint family member is a strong aroma from the leaves, be it traditionally minty or not. These plants are some of the most valuable aromatic, culinary and medicinal crops in the world – rosemary, oregano, thyme, basil, salvia, hyssop, bee balm, and lavender are all a part of this big family. Mint family plants commonly have square stems and flowers with bilateral symmetry (top and bottom do not match but sides mirror each other). The pictures in this post will hopefully help you to recognize some of the common traits shared among the mint family, and soon you will be identifying mint family species on your own! Following are my top mint family picks from our plant sale, along with a list of varieties available. One of my top picks from the mint family is agastache, commonly known as hyssop or hummingbird mint. It thrives in sun and heat and its leaves emanate a wonderfully minty scent. Its tubular flowers attract hummingbirds to the garden. We are offering it in yellow, orange, blue, violet, and pink – perfect for whatever color combination you can dream up! Blooming from early summer to late fall, agastache is a showstopper year after year in the landscape. Salvia is another sun loving flower that I will be adding to my garden this year. Pictured above is a native variety, growing as tall as 5 feet in the right conditions. Salvias come in all shapes and sizes; mound forming, tall and showy, wispy, etc., and many different colors. Their long flowering spikes add nice movement in the breezy garden and are beloved by butterflies. The sale will have saturated deep blues and magenta available, as well as lighter tones, pink and lavender. If you love the smell of Earl Grey tea then monarda is for you! Commonly called bee balm or wild bergamot (because of its similar fragrance to Citrus bergamia, source of earl grey tea), the leaves of this plant release their pleasant aroma every time you water or brush past. This year we are offering many different varieties of monarda, some native and others hybridized, in various shades of red and purple. It’s hard to only pick a few when we have so many ‘minty’ options! More than just the three discussed here, we also have catmint (Nepeta sp. ), Russian sage (Perovskia atriplicifolia) and lavender (Lavendula ‘Phenomenol’), and many more. If you come to the sale, you know where to find me – hovering near the mint family plants, sniffing away! Photos from Dyck Arboretum archives and Walter’s Gardens media resources. For me, there’s something fun, exciting, and even entertaining about gardening. It is an adventure every year. I love the journey of taking a plant, any plant, and making it grow. To see a plant transformed into something that produces a crop for me to use or a flower for me to enjoy is extremely gratifying. It’s a very personal journey, because of the time you spend and the choices you make. Actively gardening appeals to the senses. I don’t want to get all sappy, but to touch, see, hear, and watch the landscape change with a little input and time from me is very fulfilling. 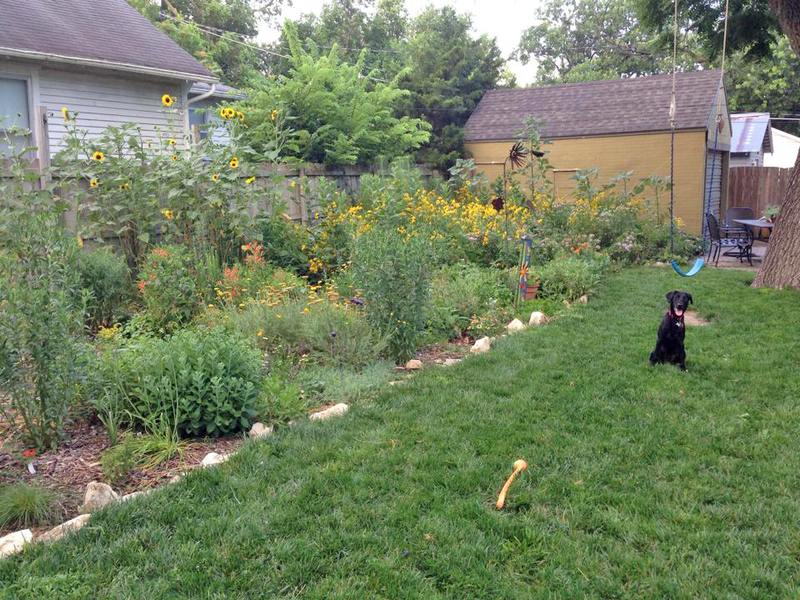 How do we make gardening landscaping more enjoyable? 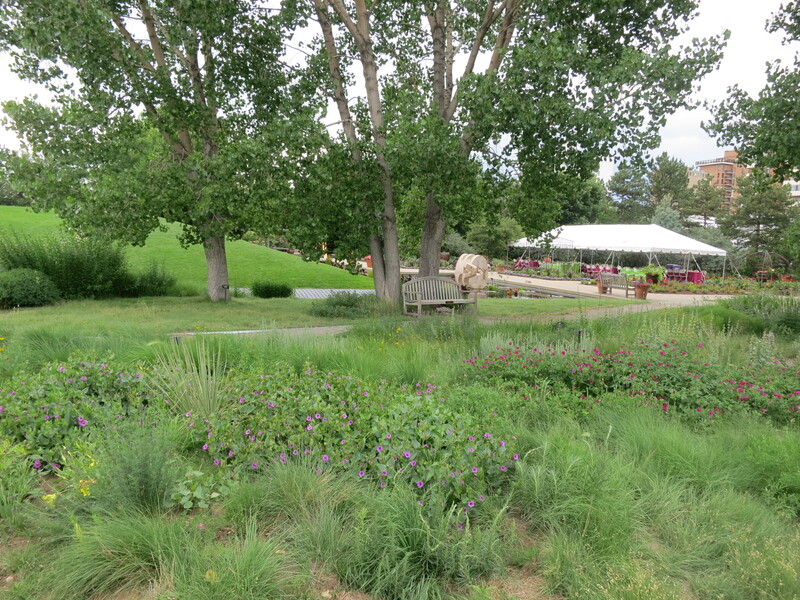 I have thought quite a bit about this question – particularly about making landscaping with native plants more appealing to the general public. What would motivate someone to spend time and energy developing a native landscape? Ultimately, it is their choice, but if it were viewed as entertainment, we couldn’t produce enough plants to meet the demand. So let’s look at gardening as entertainment. We all want to be entertained. At least I do. So here are some ways tending a landscape can entertain you. Where else can you go and get year-round beauty? If you go to the Konza Prairie near Manhattan, you can experience the natural beauty that occurs as the seasons progress. Every couple of weeks you will see something new. Subtle changes to the landscape provide surprising beauty. It is no different in our own landscapes. 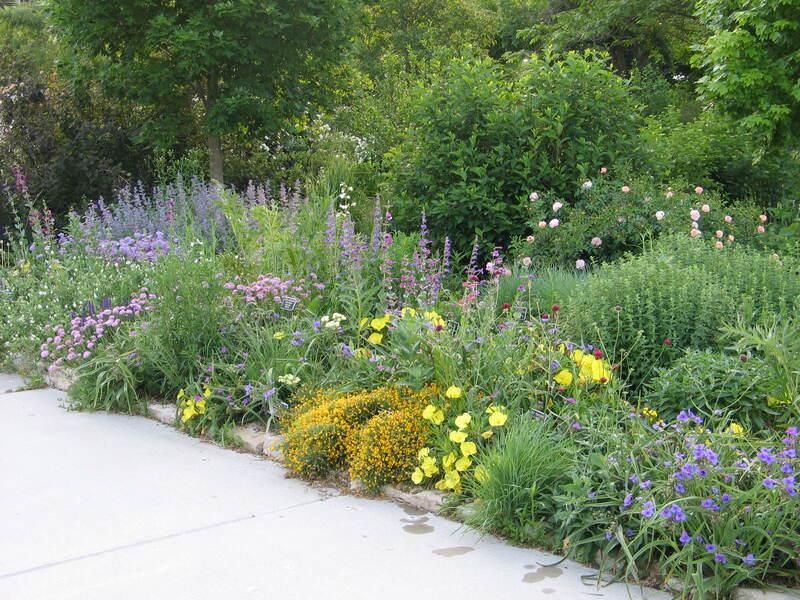 If you have just three to four plants in bloom during each season of the year, combined with some native grasses, you can mimic that larger landscape on a much smaller scale. Think of your landscape as a canvas with constantly changing colors, shapes, patterns and textures. Sounds very attractive, doesn’t it? To watch a monarch butterfly flit from flower to flower is amazing. To see a hummingbird sipping the nectar from a tubular flower can be mesmerizing. 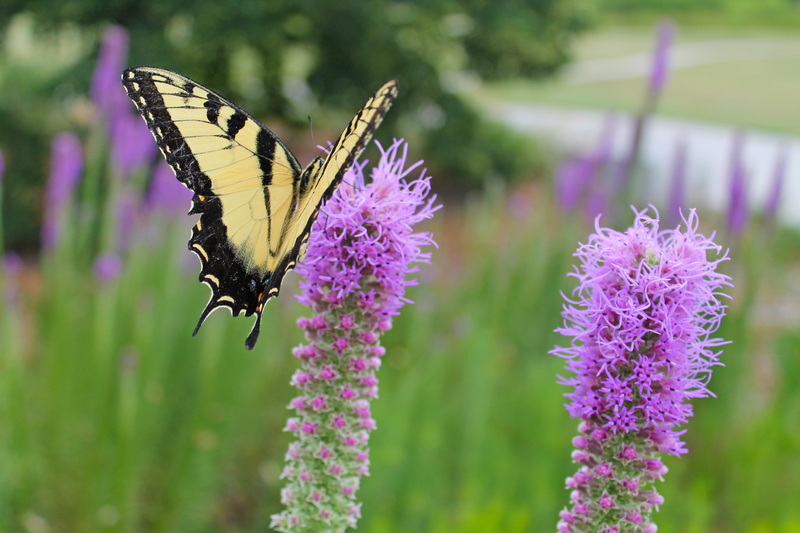 Blazing stars (Liatris aspera) covered with ten different pollinators at the same time captures your attention. 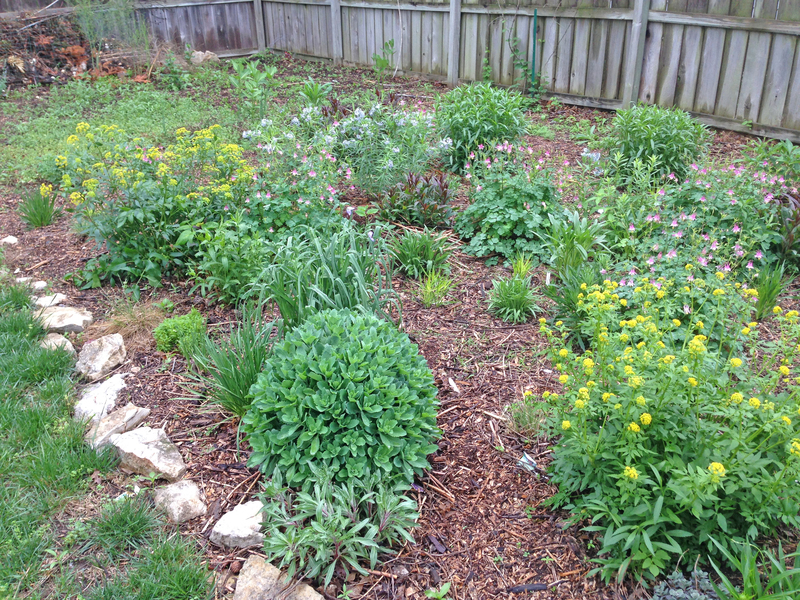 Just think about the many benefits of native plants. One of the most important benefits to pollinators is the symbiotic relationship plants and wildlife have with each other. If you enjoy live entertainment, watching wildlife in your garden can captivate your attention. We are all living increasingly busy lives. We don’t have enough time to step back and unwind. Gardens give us the space to relax. 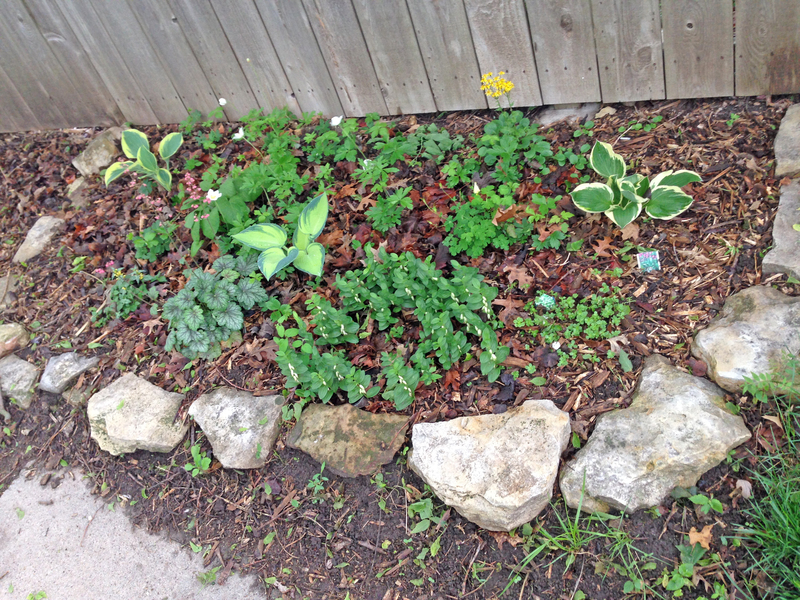 Plant a garden that is manageable. If you are really busy focus, on a small area you will use the most or see the most from your home. For me, my garden is entertainment. An oasis from a hectic life. A chance to get my hands in the soil. The smell of freshly turned soil is soothing. 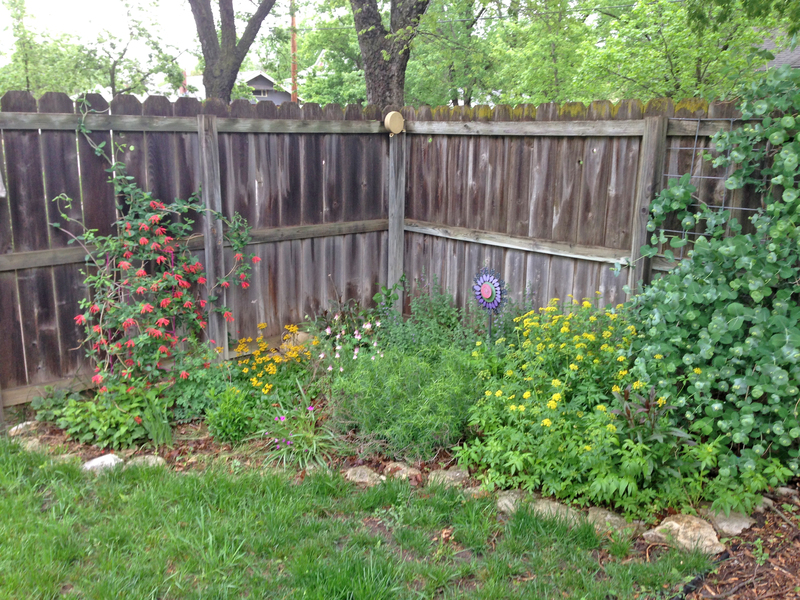 My garden draws me away from personalities, stress, and performance and brings me back to my roots. Gardening is about touching things that are real and alive, engaging the senses, and enjoying the journey year after year. Gardening is a choice worth making. Your landscape can touch your senses, give you a place to go and get the recovery you need and entertain you. A choice to garden and create a landscape for your enjoyment is never unwise. Embrace the journey!